Scotty Williams is the nerdiest 17-year-old at UK-based Havensdale College – and proud of it. However being a nerd can have its downsides, particularly when you’re constantly being targeted by the school bully Taylor Raven and his cronies. As Scotty tries to navigate his final college years with the aid of his best friend Olive, he also finds himself on the radar of the mysterious and intimidating Vincent Hunter, toughest guy in the Sixth Form. Is Vincent really as bad as he seems? Will Scotty’s darkest secret ever be revealed? Can he ever just finish his last few college years in peace? But most importantly… will any guy ever find the reasons to love a nerd like him? This story is lovely. It’s full of teenage angst. It goes a little over the top with it towards the end. But it’s perfect for the story. I loved the characters. You can’t help but feel for Scotty. He gets the raw end of the deal and Taylor is so horrible to him. Vincent is so sweet. He’s so much more than what everyone assumes he’s like. You truly feel like you get to know all of the characters as you go through the story. You want to seem them get their wishes and their dreams to come true. You can see the friendship and the bond between everyone. The best line in the book was from Vincent. “You were like the one person in the whole school I didn’t want to punch.” Big words from a guy like Vincent! The bullying was hard to read. Part of me wants to say “No way. It’s not that bad for teens today. Teachers are more aware than that!” Though I do know it’s a sadly realistic view of what teens face. It was the case twenty something years ago when I was in high school and I’m sure it hasn’t going away in that time either. I think the topic was handled well in the story. The scenes my have been graphic, but they were realistic too. Vincent and Scotty are so sweet together. They built their relationship slowly and made sure they were on the same page with intimacy. I wish more teens would treat it this way in real life. I definitely saw the blow up coming. Though I so didn’t see the who. I had that guessed all wrong! My main issue with the book was the over abundance of telling instead of showing. Sometimes events that seemed important to the story were told to us instead of seeing it as it unfolds. I desperately need a story for Taylor. I need it now! I so want more from these characters and this author. My name is Becky Jerams. I was born on 26th June 1987 and I currently live in a little flat by the sea in Southsea, UK. Over the past few years I have been involved with many different creative projects to do with music and the written word. As well as music, I have recently delved into the world of Young Adult fiction, which is something that has caught me very much by surprise and somewhat taken over my whole life (in a good way). 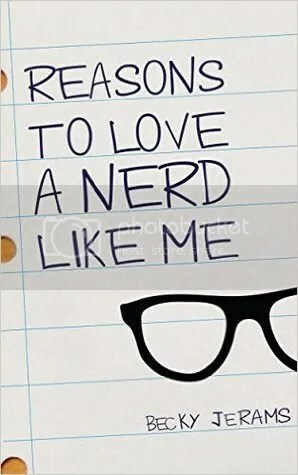 My debut novel Reasons To Love A Nerd Like Me is now available on Amazon Kindle after reaching 2.4 million hits on the free-read website Wattpad in first draft form. The story is about a gay teenager named Scotty and his complicated love life. If you would like to know more about the story then please check out the Books page at the top. I have been so inspired by the young people who have read and connected with my story in some way and I hope to continue writing stories about these characters as well as other social issues that affect teens. I absolutely love hearing from my readers and I post up any fan covers or art I receive on here as well as on my Facebook and Tumblr, so if you have any kind of creation inspired by my stories then please get in touch! I guess that is just about everything that is worth knowing about me. If you are interested in any of my work and would like to get in contact then please just send a message my way and I’ll do my best to get back to you as quickly as possible 🙂 Thanks a lot! This entry was posted in Reviews and tagged Abuse, Author: Becky Jerams, Bullying, Contemporary, First Time, Gay, HEA, High School, Location: England, M/M, Molly Reviews, Music, Rating: 4 stars, Slow Burn, YA. Bookmark the permalink.